The Water Seed (水のたね/Mizu no tane, 1975) is a unique animation by Tadanari Okamoto. He designed it for the Okinawa Kaiyouhaku no Kayoubunkan: the Oceanic Culture Museum at Expo ’75 in Okinawa. The theme of the exhibition was: “The sea we would like to see” (海－その望ましい未来/Umi - sono nozomashii mirai). The film was projected onto the dome of the planetarium in the Ocean Culture Museum. 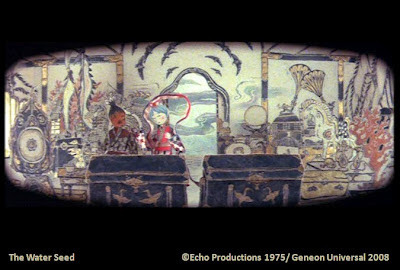 At the original screening, the animation was projected using two 35mm projectors, a 16mm projector, 1 large slide projector and 2 small slide projectors which were computer controlled. The work was later adapted so that it could be projected in a standard 35mm format. This is the version that appears on Volume 2 of the Tadanari Okamoto Box Set (Geneon Universal, 2008). During the transfer process they tried to maintain look of the cinemascope technique using letterboxing. 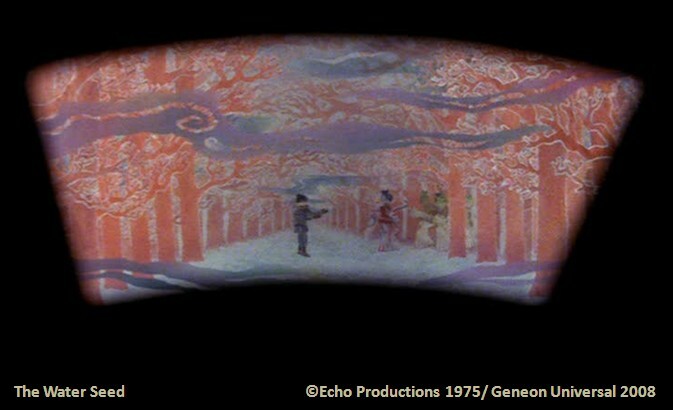 Thus the 4:3 format sections of the film are also letterboxed with black matte so that they appear smaller than the wider cinemascope sequences. The story is based on the retelling of a traditional Okinawan folk tale by Miyoko Matsutani, a Tokyo native who is famous for her retellings of folk tales from all over Japan. She has written more than 300 stories and founded the Miyoko Matsutani Folklore Research Center. 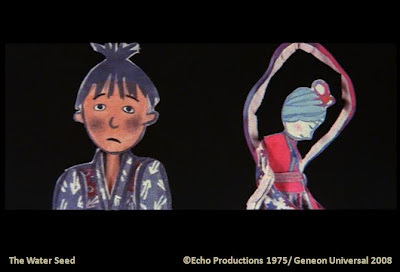 The story is narrated by the renowned actress Kyoko Kishida, who in addition to famous cinematic roles (Woman of the Dunes, An Autumn Afternoon, Manji, The Tale of the Bamboo Cutter), did the narration for some of the top Japanese puppet animation of the past half century: (Towards the Rainbow, The Book of the Dead, etc.). In keeping with the Okinawan origins of the story, Okamoto and his animation team made the backgrounds for the film using bingata – the resist dyed cloth method that the Ryūkyū Islands are famous for. The puppets and the background images were painted on kiwata cloth which is similar to what in English would be called muslin. The story is that of a young rice farmer whose fields are suffering a drought. He prays fervently at his small rural shrine and is blessed with a heavy rain shower that fills his 48 ponds and he rushes to plant his rice seedlings. One day, while on an errand, he encounters a group of children torturing a snake. He offers to buy the snake and they refuse. He then offers more money, throwing it on the ground. While the children scurry for the money, he rescues the snake and releases it into the water. Night falls, a fog descends upon him, and a mysterious woman appears out of the mist. She tells him that she is a princess by night, but by day she takes the form of a snake. It was she whom he rescued from the children. To reward him for his good deed, she invites him to visit her undersea realm. 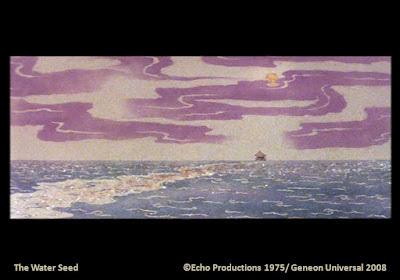 They travel out to sea on her royal vessel and the screen shifts to widescreen. The princess shows him her wondrous underwater kingdom. They spin on starfish, ride shrimp like they were horses, hunt dolphins (! ), play blind man’s bluff, and play ball. Then the farmer is treated to a sumptuous feast on a revolving table. When served a bowl of rice he suddenly remembers that he is neglecting his rice terraces. The farmer insists that he must return to his farm and the princess takes him to her treasure chambers to allow him to choose a souvenir to take with him. He is not enchanted by her jewels or gold, rather his eyes are drawn to some seeds that remind him of home. These are water seeds (mizu no tane), she tells him, and he takes one with him. They start their journey home on the backs of dragons but then the scene shifts into a dream-like sequence of a starry sky. 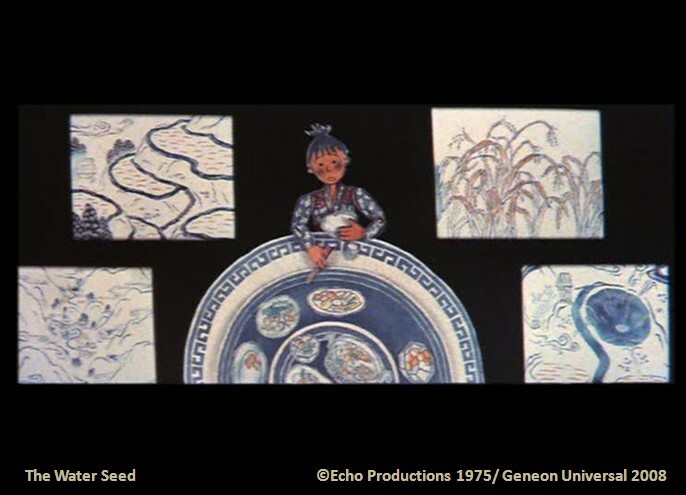 At the end of this sequence – which must have looked spectacular on the dome of the planetarium at the original screening – the man wakes up in his futon on the floor of his humble home. Did he really meet a princess and go to her magical undersea realm? Has she really given him a gift that will bring him water for his fields? Or was it all just a dream? The Water Seed also screened at the 4th Kawamoto + Okamoto Puppet-Anime Show in October 1975 and it won Okamoto his fourth Noburo Ofuji Award in 1975.